“Howl-out-loud, genuinely funny and refreshing honesty” Metro. 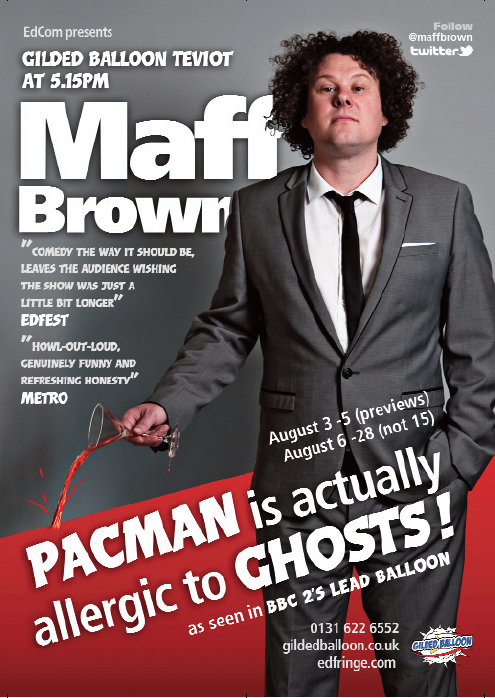 One of the comedian’s favourite comics, Maff Brown returns to Edinburgh with a high-concept new show. Just stand-up. Jokes and funnies. 50 minutes of stuff that will make you laugh. Here’s a free sample- when Stephen Fry gets an erection is it known as a Fry up? (he wrote that for Shooting Stars). Dubbed a ‘material machine’ by no less an authority than Frank Skinner, Maff regularly writes a new stand-up set every Monday when he hosts his wildly successful, award-winning comedy club Outside The Box (Best Small Comedy Venue, London at Chortle Awards). After a broken ankle stopped his footballing career as a promising right-back for Hamilton Accies, Maff’s eclectic comedy CV has seen media appearances ranging from BBC6 Music to BBC 2’s Lead Balloon via warming up BBC 2’s Shooting Stars. Maff is back in Edinburgh following 2010’s debut solo show Looking After Lesal.